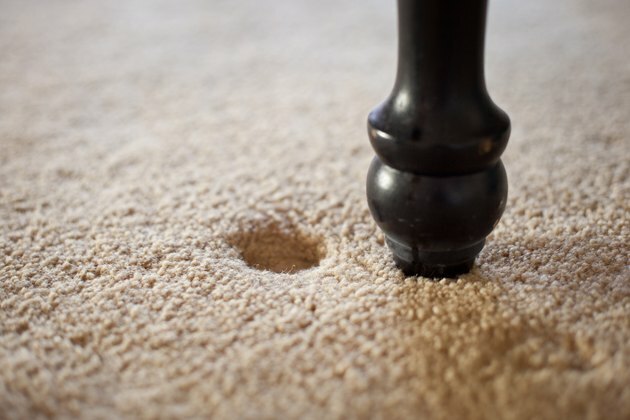 If moving your furniture reveals marks on the carpet that look like miniature craters, fear not -- the dents are reversible. Several simple techniques -- most involving some form of moisture -- make the carpeting look as it should once again, rather than like a poor rendition of the moon's surface. Place one medium-sized ice cube in each dent for small indentations such as those caused by sofa legs. 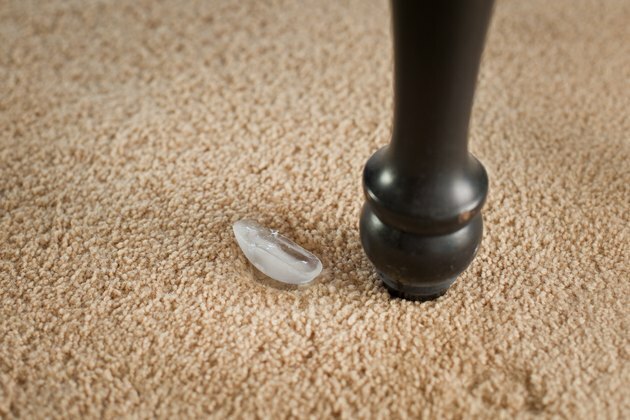 For larger indentations, use several ice cubes -- the goal is to wet the carpet fibers slowly, allowing them to soak up the moisture as the cubes melt. Wait several hours or overnight, then brush the fibers of the affected area gently with a wide-toothed plastic comb or with the edge of a plastic gift card. For a carpet with tall fibers, use your fingertips to comb over the area, which coaxes the carpet fibers back into their original positions. 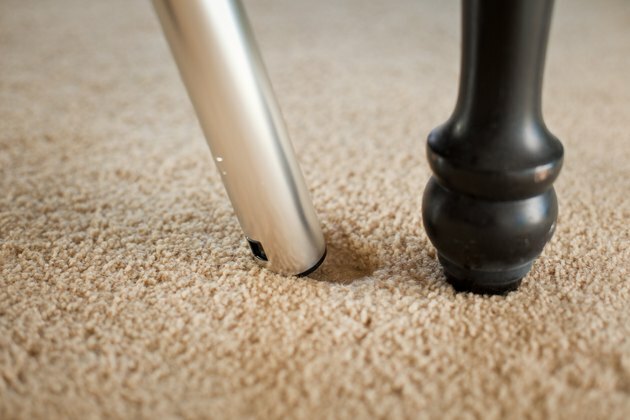 In some cases, vacuuming the dents and their surrounding areas may plump the carpet fibers back up into their original positions. Run your fingers through the carpet fibers a few times, rubbing your hands back and forth through the fibers. Rub the edge of a plastic gift card through the fibers if your fingers aren't helping much. Vacuum the carpeting. If the regular floor vacuum setting isn't working well, use the removable hose and nozzle to apply stronger suction directly to the affected area, vacuuming both the dents and the fibers adjacent to them. 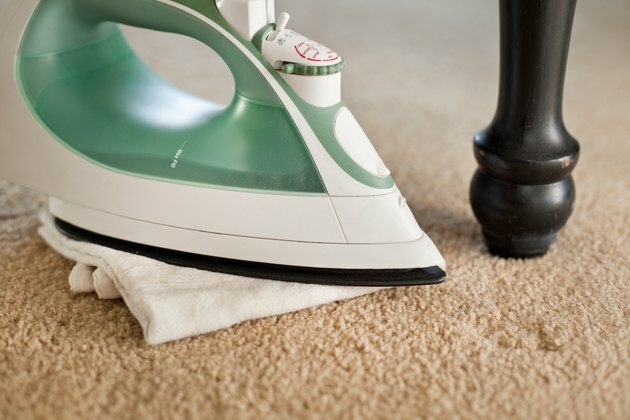 Steam offers help for stubborn or large carpet indentations. 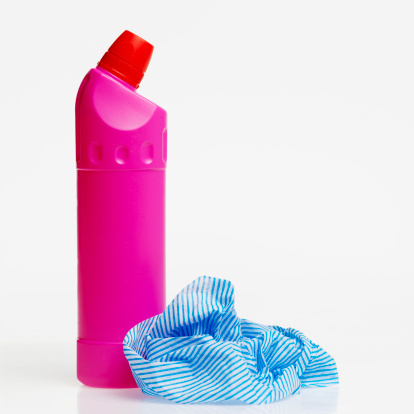 Moisten a lint-free, white cotton cloth such as a tea towel so it is damp but not wet enough to drip. Place the towel over the affected area, then iron it with a clothes iron on a cotton setting, ironing slightly beyond the dents. Remove the iron, leaving the towel in place to dry over the carpeting. Lift the towel away once it dries, or after several hours. Some types of carpeting, such as berber, are notoriously difficult when it comes to dents. Since the fibers are tightly woven, rather than standing straight up and tall like a plush or pile carpet, it takes longer for dents to release. Several methods may be required to completely remove the dents. Spritz the dented area gently with a mist of water, then run your fingers or the edge of a plastic gift card back and forth over the dented area. Steam the dents with a carpet steamer or with a damp white tea towel, ironed in place, then run your fingers or the plastic card through the fibers again. If still dented, spray the affected area with a light mist of water, run your fingers through the fibers, then heat the area with a hair dryer set to medium heat for several minutes, pausing every minute or so to comb the fibers with the card or your fingers. Take caution not to overheat the carpet, just apply enough heat to make the fibers expand.